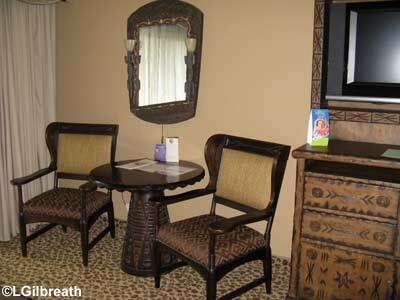 Tuesday was moving day, and we were moving from the Boardwalk Villas to Animal Kingdom Villas. After we'd packed up our stuff, gotten breakfast from the Bellevue Room (bagel for Lee, fruit for me), and schlepped our baggage out to the car, we walked over to the Studios. 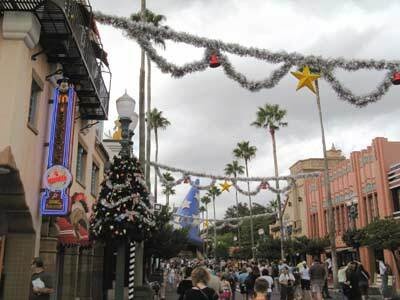 Christmas had come at some point since Saturday night - no tree yet, but garland was strung over Hollywood Blvd and those glittery Christmas trees were hanging from the lampposts. 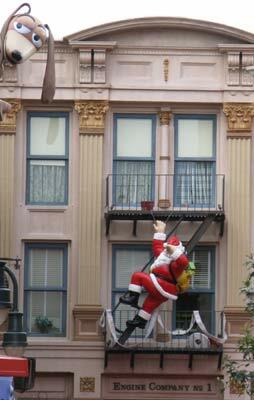 There were also foil trees back near MuppetVision, and Santa had arrived way early and was hanging off the fire escape near Pizza Planet. Lee wanted to see the Lights, Motors, Action! 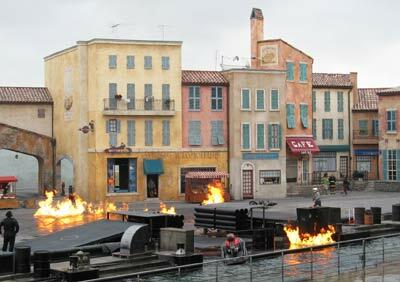 stunt show, so we got in line for that. It started to rain lightly before the show, then it stopped, but then it spit on us a little bit during the show - though not enough that they had to change the show, I don't think. I still say the whole "Car Ballet" thing goes on waaay too long - those are pretty inept bad guys if *5* of them can't take down *1* hero car. We were hungry by then, but nothing that's available in the Studios sounded good to us, so, guess what, we walked over to Epcot to Eat Around the World again. That's Round 5, for those keeping track. :-) And it actually turned out to be the final time. On a Tuesday afternoon the F&W Festival was pretty quiet - I don't think we waited behind more than one other person, and most of the time walked right up to the register. We saw no reason to try anything new this time, and just went for our favorites. So I had a Lamb Slider (though the CM serving it up was quite stingy with the lamb - I only got two slices, as opposed to 5-6 the night before), a Greek Salad, and Chilaquiles. Oh, and a Woodpecker Hard Cider from the UK - I love those, and hadn't had one yet this trip. Lee had a Beef Empanada and the Chilaquiles and a Bass Ale, also another cup of Butternut Squash soup. We split the Debrizinger sausage - I got the pretzel roll and sauerkraut, he got the sausage. :-) He got another Pecan Pie, and I tried the Macadamia Nut and Chocolate Bar from Australia...how can you call it a "Nut and Chocolate Bar" when there's no chocolate in it??? It was disappointing. On the way out he got another of those awful Sweet Teas from the Great Country of Oklahoma, while I tried the Honeybush Iced Tea from the Twinings Tea Garden in the UK. It had an interesting flavor - it needed just a little bit of sugar, though. We walked back to the Boardwalk parking lot and drove over to Animal Kingdom Lodge to check in - it was interesting that at both DVC resorts this trip the guard at the Security shack printed out our parking passes for us as we arrived. It was just after 4:00 so our room was ready, and check in went very quickly. 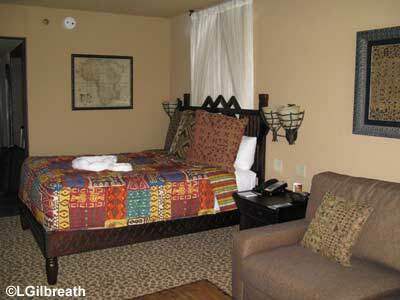 We had a savannah-view studio on the 5th floor, Zebra Trail, Room 5528. I really liked the decor - a lot of people say that it's dark, and that's true, but it was still very attractive. 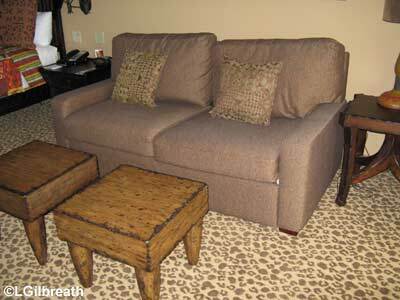 We had a queen-size bed and a pull-out queen-size sofa bed, a table and two chairs, and two wooden coffee tables/foot stools. 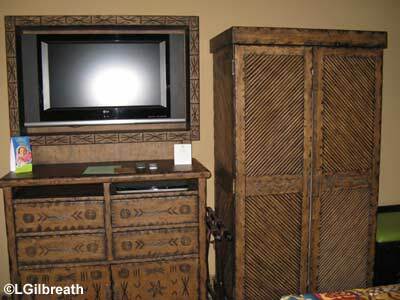 There was also a flat-screen TV. 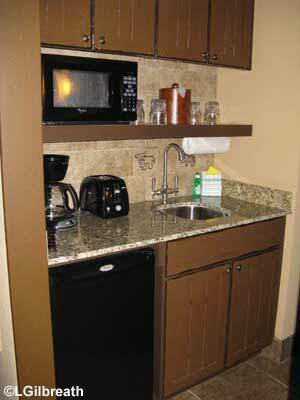 Since these rooms were originally regular hotel rooms that were remodeled into DVC units, the kitchenette was placed where the closet used to be. So instead of a closet we had a wardrobe, which also held the vacuum cleaner, iron and ironing board, and fold-up crib. Which didn't leave a lot of room to hang clothes, but it worked out ok for us. I think clothes space would be very cramped if you had 4 people in the room, though. And there was really no good place to put our suitcases - we ended up stashing them between the sofa and the curtains. 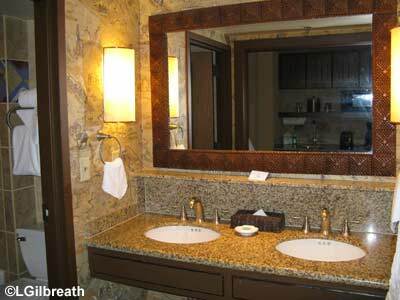 The bathroom area was pretty nice - there was a full-length mirror on the outside of the door, and the shower curtain on the bath tub had little hidden mickey heads in the border. Our room overlooked the Uzima Savannah. Unfortunately it was tucked back in the corner, and the "people corral" that's there in case they have to evacuate the building, was right behind our room. Though it didn't matter that much since we never saw very many animals on our savannah. There were one or more elands on it just about all the time, and it was almost like they had claimed it as "their" territory and the other animals stayed away. 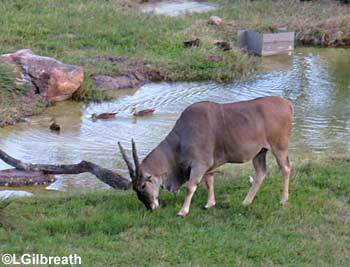 We had several giraffes pass through from time to time, and the odd impala or bontebok, but never groups of Thompson's gazelles or impalas. 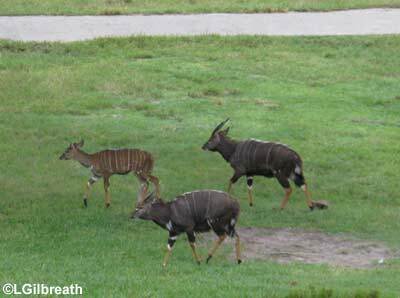 We know they were on our savannah, though - one afternoon we walked to the end of the hallway and out onto the external staircase, and we could see Thompson's gazelles, impala, bontebok, giraffes, and other antelope-type creatures I didn't recognize. We grabbed a quick bite to eat at The Mara - Lee tried the African Stew, I had the butternut squash soup (which seemed bland since I'd gotten used to eating the curried version from the India booth! ), and we split a Mara salad. This was around 5:30, and there was hardly anyone in the place - that was a surprise. I think the food offerings at The Mara were more interesting when we originally stayed here, but that was over five years ago. We met our friends Paul and Ilene over near Country Bear Playhouse, and visited while waiting for the parade to start. It started raining again, so we huddled under our umbrellas, but fortunately it stopped before the parade started. 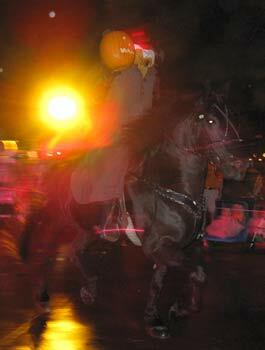 Because the street was wet we weren't sure if the Headless Horseman would come by or not - he did, but at a slow trot and not a gallop. He was sure a lot easier to see that way! If not for the big yellow light on the other side of the street I might have actually gotten a decent picture. 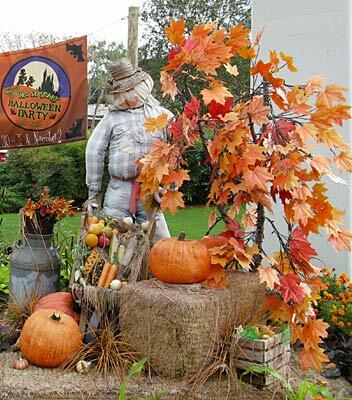 I loved the "Boo to You" Halloween parade - so many fun things! 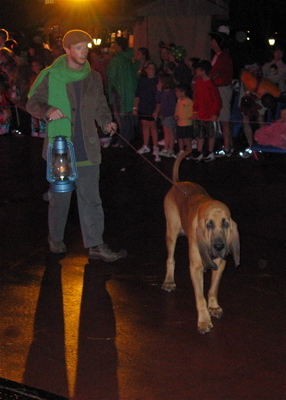 The Haunted Mansion sequence was my favorite - led off by the nervous graveyard caretaker with his lantern and his bloodhound. They were so cute. 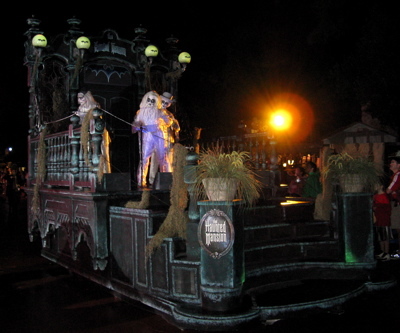 Then all the ghoulish dancers and the Haunted Mansion float, followed by a zombie gravedigging drill team. 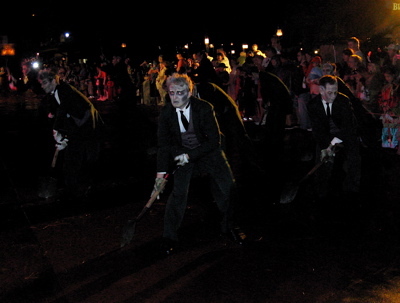 They were dressed as Haunted Mansion hosts, but were carrying shovels, which (in unison) they would perform various maneuvers with - my favorite was sliding the shovels across the pavement to create sparks. 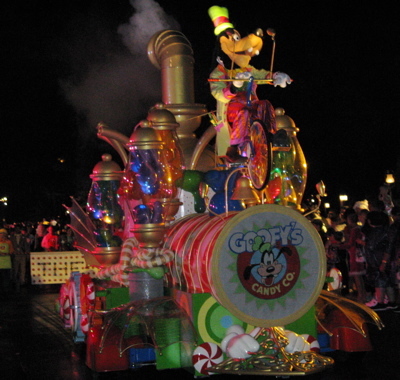 The pirate sequence was good too, and all the characters - some in costume - were fun to see, as was the villains float. 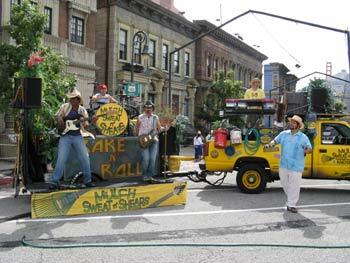 I really thought it was a terrific parade. Once the parade ended the four of us rode Pirates of the Caribbean - walked right onto it. That was something I found odd - there were no lines for the attractions but there were huge lines at the treat stations! We didn't stand in any of those, so the only candy we got was a few pieces they handed out at the end of the parade, and the bags of Kissables they were giving out at the entrance to Pirates. 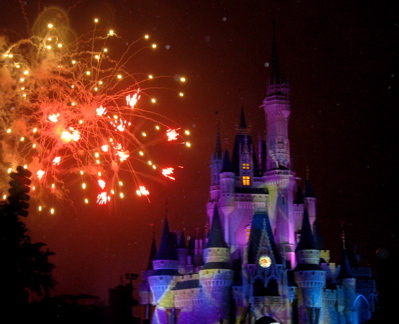 By the time we got out of Pirates it was too close to the start of the fireworks to really go ride something else...so we went to the hub and got a spot for the fireworks. And it started to rain. :-( And this time it was more serious about it. Lee and I only had the one umbrella (mine), and since he was holding it, my back (especially my skirt) was getting pretty wet. The rain let up just a bit during the fireworks, but I didn't get to enjoy them as much as I had hoped from under an umbrella! It was a really good show, with all of the spooky pumpkins and ghosts and colors projected on the castle, with a very interesting soundtrack. Towards the end of the show it started to rain a bit harder - so after it ended we headed for cover in Tomorrowland - specifically the Monsters, Inc Laugh Floor Comedy Club, which we hadn't seen yet. It was a cute show - even "That Guy" seemed to enjoy it. 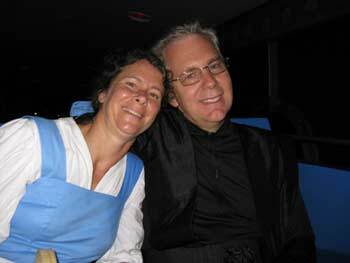 :-) When we came out of the show it was raining even HARDER - so we went to Buzz Lightyear's Astro Blasters. I thought it would have a line, but it was a walk-on. We got stopped for a short time in the volcano room, and I was able to hit that several times to increase my score, though I didn't max out. I do a lot better on the Buzz ride in Florida than I do in California. It was still raining...we avoided a big puddle in front of the escalator up to Tomorrowland Transportation Authority (TTA) and rode that. I'd forgotten that it has a bit of momentum when it goes around the curves, and we were all getting thrown around a bit and laughing. But it was dry, though we could see the rain coming down. 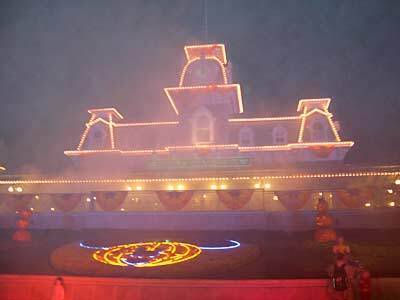 We were amazed that there were actually people out on the Tomorrowland Speedway in the rain. The lights were on inside Space Mountain - guess they'd had some kind of a problem. When we reached the unloading area it was STILL raining, so we went around one more time, since there was no one waiting to get on. By the time we finished our second tour of Tomorrowland the rain had mostly stopped. By then we'd missed the second parade...Ilene and I had both wanted to see it again - but not in the rain. 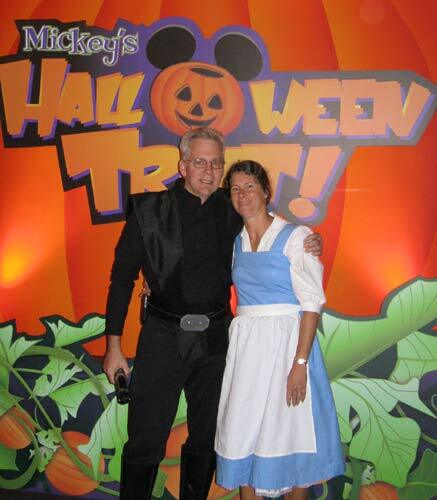 It was after 11:00 and the party ended at midnight (the witching hour - how appropriate!) and we went to Fantasyland, figuring the lines would be short. Paul and Ilene kindly offered to drive us back to Animal Kingdom Lodge, but since they were staying at Port Orleans it was way out of their way, and we took the bus. We waited just a few minutes for one to pull up, and were on our way back "home" soon. We had really good luck with the Animal Kingdom buses during our stay - we never waited more than 10 minutes at the resort or at a park, and usually it was less than 5 minutes. Another late night - at this point we might as well just stay on California time for the rest of the trip! 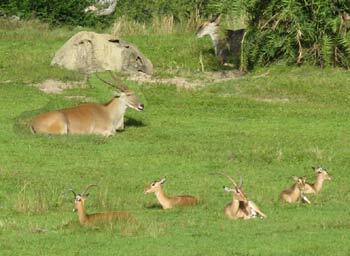 We couldn't believe it - here it was the 6th day of our trip, and we had not yet been to Animal Kingdom! That's usually our destination on our first morning. After breakfast at The Mara (a whole lot more crowded than it was the previous evening!) we took the bus to Animal Kingdom. I don't think we arrived there until 10:30. I thought it might be a bit crowded but it wasn't - Everest at 11:00 had maybe a 10 minute Standby wait. That's still a great ride. As we walked by the theater they were seating people for the Finding Nemo show, so we did that...I'm not really any more impressed with it than when I originally saw it - the puppetry is great, but the songs are weak. Since our favorite restaurant, Tusker House, is still closed (and even once it re-opens we aren't likely to eat there, since they are turning it into a (shudder) Character Buffet), we had lunch at Flame Tree. I had the barbecue chicken salad, which was good except that they used too much dressing, and Lee had the pulled pork sandwich. We checked out the Standby line for Kilimanjaro Safaris but it was 40 minutes, and no more Fastpasses were available, so we went to Pangani Forest instead. 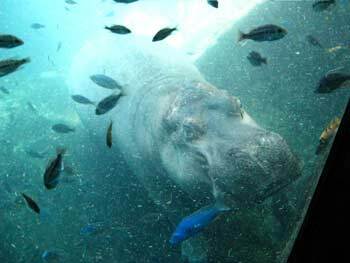 We had a really nice visit in there - we saw several okapis, and we saw a hippo doing laps around the underwater viewing area. I don't remember ever seeing a hippo there before, or if I have it was sleeping, so it was really nice to see one that was doing something! They move so gracefully in the water. Because of some on-going construction, all of the animals and reptiles were missing from the Research Building. Not too many birds in the aviary, either. 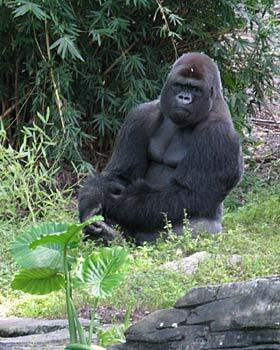 We didn't see any gorillas in the area that houses the family troop, but there were a couple of the bachelors out and about - including one who was posing nicely for photos. Back to Asia, we got a treat (it WAS Halloween, after all!) 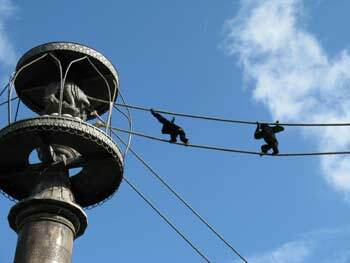 - a couple of the siamangs were going hand-over-hand on the ropes between two of their towers. We wait for a few minutes to see if they headed off the other side, but they didn't, so we went to the Maharajah Jungle Trek instead. Not much activity back there...even though it was about 3:45 by then the tigers hadn't woken up for the day. And they are doing work on half their exhibit so only two of them were out instead of 5 or 6. Back to Harambe again - the parade had just started, and we thought it might be a good time to ride the Safari. We still had to wait 10-15 minutes, but that was a lot better than 40! We hadn't been on the Safari since they modified the warden's recorded spiel. That silly Miss Jobson is gone now, and there's no more Big Red and Little Red kidnapped by poachers - the baby elephant is just an unnamed lost elephant found by the wardens. We still end up chasing poachers at the end, though. Sigh. 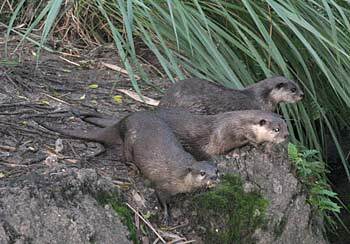 On the way out of the park we stopped to watch the otters - and they put on a wonderful show for us. There were three of them, and they were scampering all over their island, swimming around it, and making a lot of little chirping noises. We think it was getting close to feeding time, and that's why they were so active. We took the bus back to Animal Kingdom Lodge. 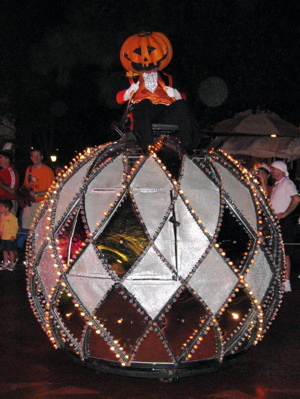 In the Lobby there was a display of pumpkins set up that had been carved by Cast Members, and there was a contest with a bunch of different categories, like Best Animal Kingdom Lodge theme, Best Disney Theme, Most Frightful, Most Original, etc. We'd voted before we left that morning, and the results were up when we got back. I wish I'd taken pictures of them. 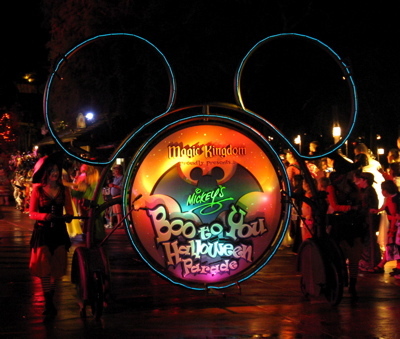 My favorite, and the one which one Best Animal Kingdom Lodge Theme, was one that was set up as a drum. A piece of cloth or canvas had been tied around the top to make a drum surface and then various African symbols were carved into the side. It was really nicely done. They had a trick-or-treat scavenger hunt for the kids around the Lodge, and we saw lots of them running around getting candy. We relaxed in our room for a while before "dressing up" for our dinner at Jiko. The restaurant was VERY quiet - there were lots of empty tables. Our server told us it was because of Halloween. 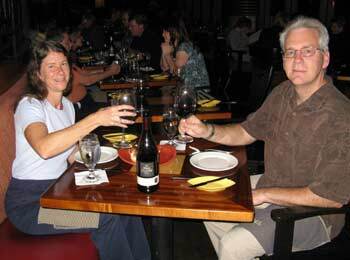 It was a very nice leisurely dinner - we were there for about two hours. We decided to get a bottle of pinot noir - figuring we wouldn't drink the whole bottle, but we could take it back to the room with us. I'm not a big red wine fan but I'm learning to tolerate some pinot noirs, and since I was planning to have the lamb for dinner white wine didn't really work! I've had pinots that I liked better, but this was not bad. 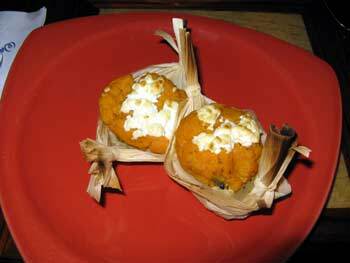 We split the Maize and Sweet Potato Tamales - herbed maize pudding and truffled sweet potato mash with shredded goat cheese in corn husk boat. Those were really good. 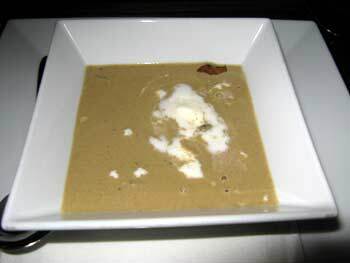 Lee also got the Roasted Golden Chanterelle Soup - aka mushroom soup with toasted pumpkin seeds and white truffle whipped cream. It was served in an interesting way - they brought out the bowl with the pumpkin seeds and cream already in the bottom, and then poured the soup from a small pitcher. Lee enjoyed it. It took a while before they brought the bread out - I recall getting flatbread here before, but we were served squares of something that was more like cornbread, only not made with corn. The flavored butter they served with it gave it an interesting taste - a little bit kicky. 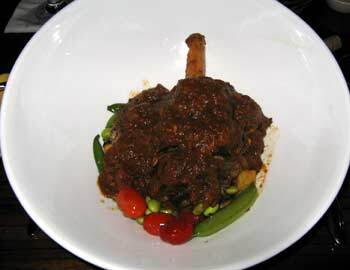 For entrees, I ordered the Berbere Braised Lamb Shank, only I asked for the vegetables of the moment with it instead of the toasted couscous and baby spinach. So it came with tomatoes, potatoes, peas, green beans, and asparagus. 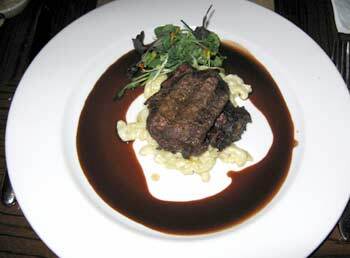 It was a huge amount of meat - so tender that it was flaking right off the bone - I didn't need a knife at all. Really a very nice flavor, though there was a little too much berbere sauce. 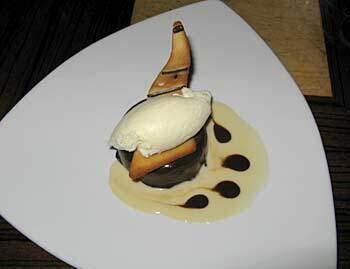 I must admit that I'm usually disappointed in the dessert selection at Jiko, and there wasn't anything I was really wild about this time, but we ordered the Tanzanian Chocolate Cheesecake with chocolate ganache, Amarula sauce, and lavender ice cream to share. It was pretty good, but to be honest the chocolate mousse cake we had at the Boardwalk Bakery earlier in the trip was a lot better - and a lot cheaper. Lee watched the Halloween episode of CSI: New York when we got back to the room, and I worked on photos and blog entries. 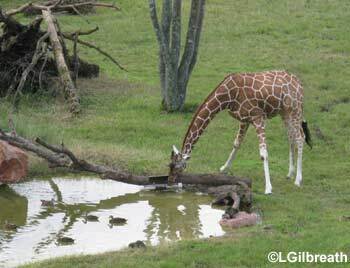 Text and photographs copyright © 2007 by Laura Gilbreath. Feel free to link to this document, but you may not redistribute it in any form without the express written consent of the copyright holder.